*When did you begin blogging and what inspired you? i began blogging soon after my husband matthew and i got married. during the wedding planning process i discovered so many blogs that i absolutely fell in love with (i was in search for cute DIY things). after the wedding day passed, i had a lot of extra time to do something new and decided that i would start a blog as well. i wanted to document my creative journey, life as a newlywed and everything in between. *Do you have any features you created on your blog? If so, tell us about them/it. since i started blogging back in november i have created a few different features. one being "in her shoes" every wednesday i share what a day in someone's shoes is like. i ask the same question of everyone. it is really interesting to see the differences. what makes that person tick and what motivates them to get their day started. i also recently created a feature called "a tattoo story" this feature is simply someone sharing their tattoos, their story and what the meaning is behind what they have. i am a fan of beautiful tattoos and am inspired by the wonderful stories that come along with them...this is the reason i started this feature. *Do you have advice for other bloggers who are just starting off? be consistent, post often, and include pictures! when i first started blogging, i found that posting frequently was one of the most important things. obviously if you don't have something to share, that is okay...but sometimes you can get inspired by just looking around. when i find myself lacking inspiration i go to sites like we heart it and just take a look at all of the beautiful pictures. sometimes i'll come across one that triggers some type of memory, when this happens i share it. it seems as though these posts become the most popular and are the ones that people can relate to the easiest. there are no rules when it comes to blogging...that is what makes it so fun! *What is a perfect day in your eyes? the perfect day for me is when i can look back at what i did and know that i worked my absolute hardest to make my dreams come true. Hey everyone! I'm here to tell you a little bit about myself and my little blog, Relevant Notes. 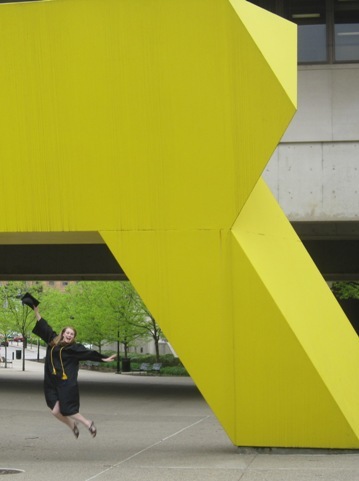 I'm a student, and I just graduated last weekend from the University of Pittsburgh! I studied Computer Science and Linguistics, which gives me more than enough excuse for being a complete nerd :) I'm sticking around Pittsburgh for a year of grad school, and after that - who knows! I am super excited about spending the summer in the city and blogging about day trips and whatever other fun I find!